Having an area to help aid you getting in and out of your Wrangler JK is good idea. Why not add some style as well with the RAL Running Boards which gives you a wide 5.5" stepping area that can hold up to 400lbs. and are made from aircraft grade aluminum that is twice as thick as most aftermarket running boards. Comes in your choice of silver with black end caps or black. Design: Adds a modern European style to your Wrangler JK that will get you noticed and has a wide step area to help you get in and out of your Jeep. 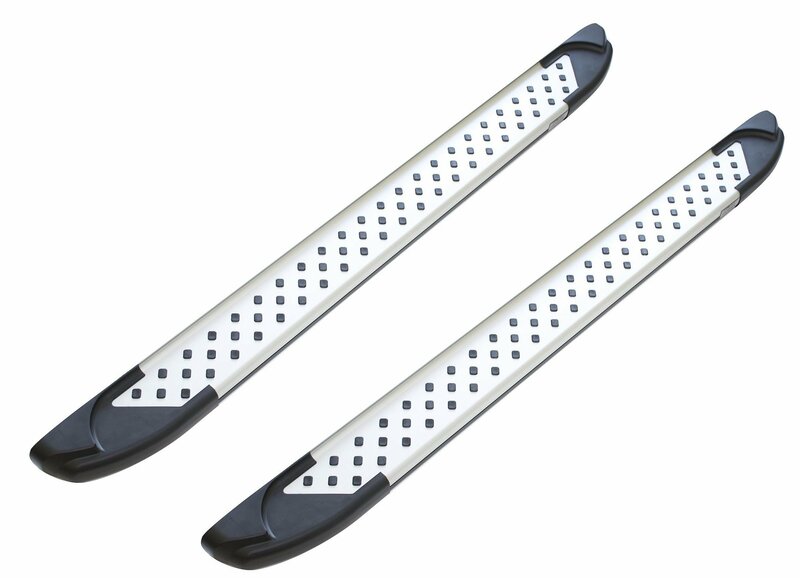 Made from triple wall aluminum extrusion making them twice as thick as other aftermarket running boards giving you better durability and strength. Grip Assurance Technology: Along with a 5.5" stepping area you can be assured that no matter how wet or muddy your shoes are the surface will give you plenty of traction so you will not slip. Installation: These running boards come with mounting brackets & hardware to make installation smooth so you can get back out there and enjoy the open road or trails.